Building Models Cranky s Way (120 pages, over 200 photos) written by Virgil Suarez (aka Doctor Cranky) who is proprietor and resident Mad Styrene Scientist of the World Famous Doctor Cranky s Lab-RAT-ory. This book shows beginners, intermediate, and advanced model car builders how to make their models ZING, ZAP, and POP! with dramatic weathering techniques, flair and character. This book will help make turn your models into unique MASTERPIECES and you will develop your own building style. 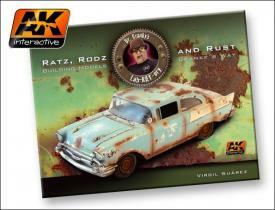 * Doctor Cranky shows you how to weather your models to get them rusty, crusty and dusty. * Basic, intermediate and advanced airbrushing tips and techniques. * Create custom graphics and special FX. EVERYTHING you ever wanted to know about creating unique car models that will have people saying WOW. Plus an exclusive gallery of Doctor Cranky s creations, profiles of some of Doctor Cranky s favorite fellow builders, and much, much more!